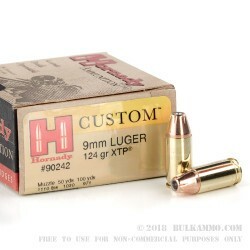 Hornady Custom's XTP bullet is renowned for its superb accuracy and deep penetration. This standard pressure 9mm Parabellum load will work great in your Springfield XDs, Sig P938, or any other CCW gun thanks to its mild recoil. 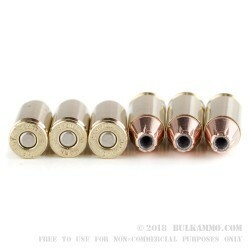 The 124 grain jacketed hollow point bullet offers balanced performance characteristics, imparting 339 foot pounds of muzzle energy and achieving muzzle velocity of 1110 feet per second. Each box contains 25 rounds in top quality brass cases. Founded in 1949 by J.W. Hornady and headquartered in Nebraska, Hornady is a relatively recent entrant to the loaded ammunition market. For much of its history, the company made highly regarded components for other ammo loaders. 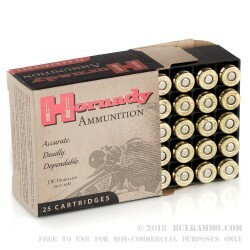 In the 1990s, the first Hornady branded ammo hit the market and became a major success. Thousands of CCW license holders and law enforcement officers rely on Hornady cartridges in their firearms. A family-owned company, Hornady currently operates under the leadership of Steve Hornady, J.W. Hornady's son.